Donald Trump called for Democrats to concede and the turn outs hit him in the face. The race was a hotly contested one that became symbolic of the nation’s issues with over race and class in the Trump era. 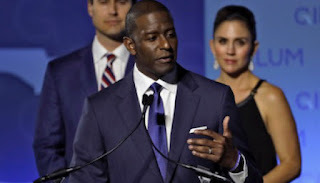 After a long, hard battle to become the first African American governor in the history of the sunshine state of Florida, Tallahassee Mayor Andrew Gillum as gracefully bowed out. Gillum, the Democratic gubernatorial candidate in Florida, conceded to his Republican adversary, former Rep. Ron DeSantis, on Saturday evening which ended the extended fight that saw the Tallahassee mayor retract his Election Day concession during a statewide recount. Those matters became a major focal point during the primary and escalated when DeSantis went on Fox News a day after the primary to extol Florida voters not to “monkey this up” by voting for Gillum.